Huiwen invited us over to her home in Woodlands to get our nails done and we'll be leaving her details (address and directions), along with a discount code (yay!!) , at the end of the post, so just check that out once you're done! Huiwen works as a one-(wo)man business, and we totally admire that! Such independence indeed, we have such admiration for her! Her humble work area is located inside her home (which is HUUUUGGE for a HDB), and she lets her customers sit in one room that is fully dedicated to her art. Behind me you can see her shelves of nail polishes, cleansers, glitter powders, everything. The array doesn't look overwhelming here because she kept a lot of them in her carryon case which she brings for her appointments. You don't have to worry if you want to do something colorful though, chances are very high she has the colors you'd like! 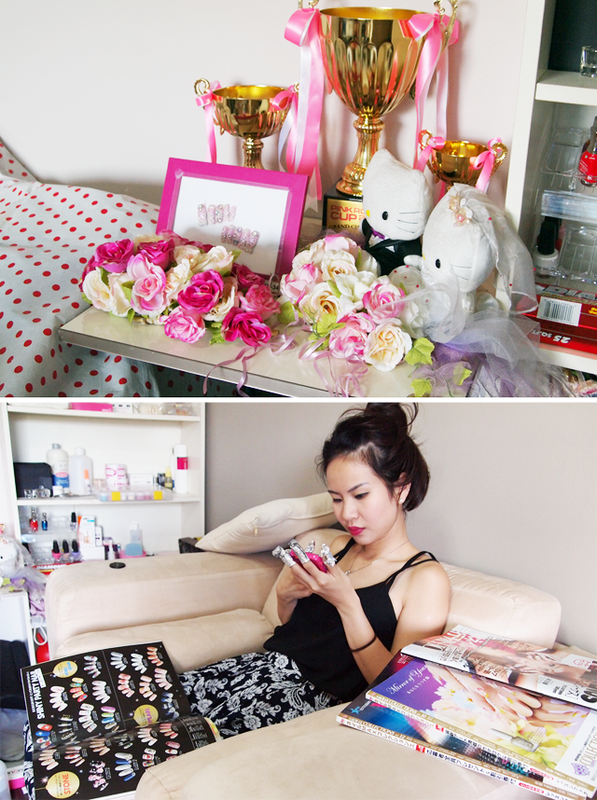 On the table with the Hello Kitties, she has her amazing championship awards won from the Pink Room International Nail Academy competitions over the years. The largest trophy was won just a year earlier, when she joined the "Stone" Nail art category and nailed it with her amazing masterpiece! Here's her final competition submission up close Don't these look amazing!?!? It's no wonder that she won! When Ashley and I saw it, our jaws literally dropped open. Even as graphic designers we don't have the patience to be this articulate or meticulous with our finger work. It totally blew us away. Feel free to even ask her to carry out this design for you, though you should probably be prepared to pay for it, lol. 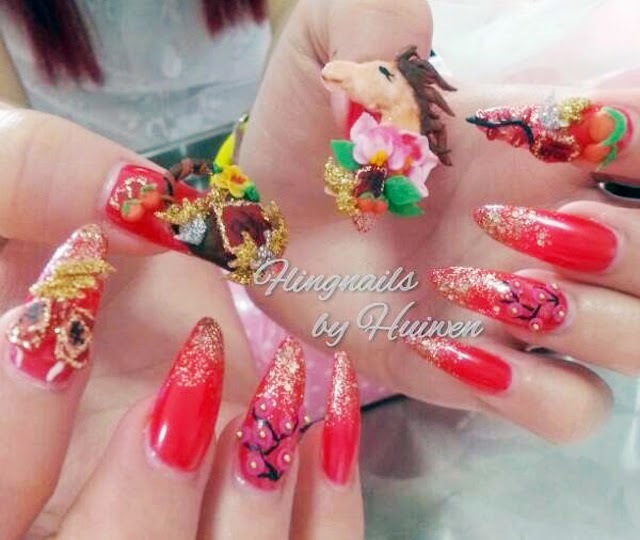 Here's a pretty crazy one she did over Chinese New Year! When she told us about it we were stunned. She actually made a 4D horse and a bucket of gold from scratch, which took a good few hours (duh!?) and glued it onto her customer's nails! Can you guys see the oranges too!? 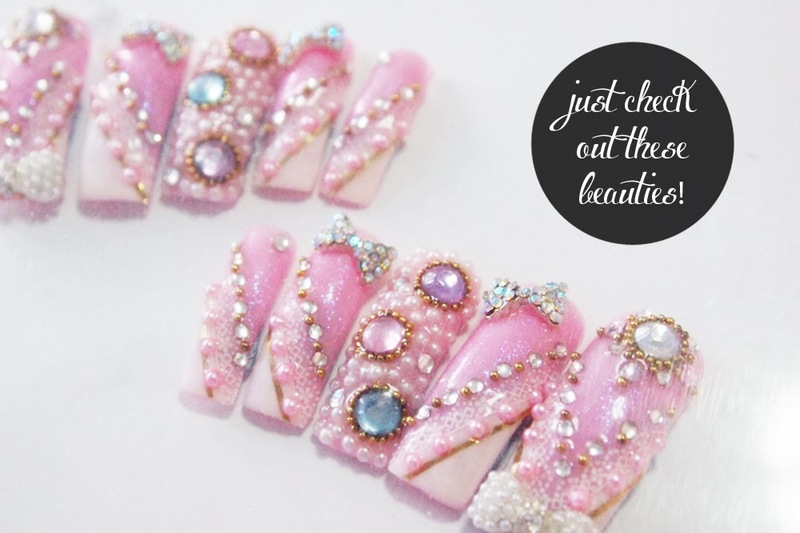 It truly takes the meaning of nail art to a whole new level, we were so impressed! If you're a fan of pretty but simpler designs than the 4D crafts.. you can always opt for those above! They're just as lovely with the added bonus of being extremely wearable and comfortable throughout! It's all really up to you, just go to her Facebook (link at bottom of post) and see what other spectacular designs she has to offer! Right, so now let's jump into our wonderful experience! Huiwen made us feel very comfortable in her working room, where there were two armchairs for us to relax on. There were also magazines for us to flip through before deciding upon our designs. And as women, even though we already decided what we wanted by going through Tumblr Nail Designs.. these other options just drove us insane hahaha - more specifically, me. Whilst Ashley was getting her nails done, there I was spending ages on what I wanted. Therefore, just a heads up - be very very sure of whatever you want to do when you get there, so it saves time! Ashley and I both chose to do gelish because we had 2 events coming up to attend, plus we are just so rough with our nails. 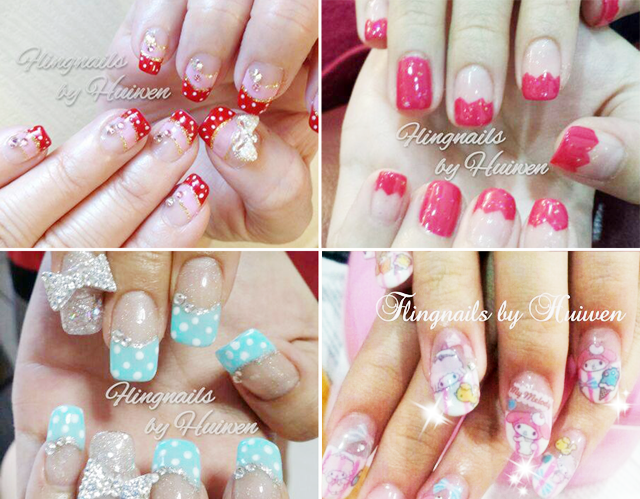 Huiwen graciously accommodated us, and took out her amazing gel polishes! She only uses high grade ones, called Angel Pro, from Korea (as seen above). Apparently, a tip to note is that really good gel polishes soak off really fast and dry off under LED lighting super quickly as well! Huiwen had this super quite LED light in the form of a pink bow. Ash and I were totally gushing over it hahaha, I guess she really knows her crowd. ;) What I really enjoyed was how she had such stable hands and was unwaveringly patient throughout. She constantly asked us if the designs were suitable, if we liked the strokes, if the color was saturated enough, etc! We felt so bad she had to be that detailed, but we truly appreciated every bit of her effort! 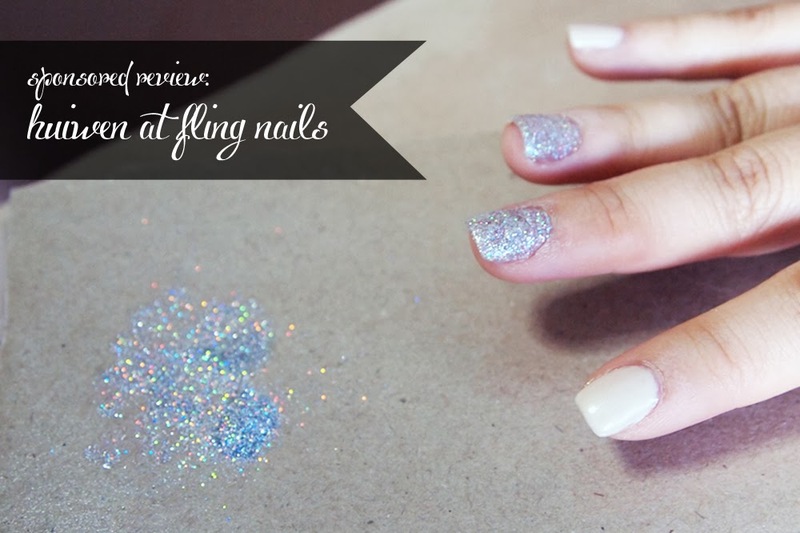 P/S: Huiwen even bothered mixing real glitter with glitter gel polish to get that really beautifully packed on look! Ash was so stunned by the result! Here's what our finals look like! Aren't they soooo beautiful!? When Ash and I were done with our nails we just couldn't stop staring at them! We've personally never had nails this lovely, and we once again couldn't believe how lucky we are. If you want to do designs exactly like ours, just show Huiwen these pictures, she will definitely recreate yours to a T.
If you'd like to do something you found online, simply whatsapp her the images to prepare her in advance. She's very prepared for everything, which we simply love! P/S: In case you're wondering, something like ours will cost you about $60. SO WORTH IT! I once did a gelish manicure with a design ON ONE FINGER (!!?!) and in only two colors (!!!??!) for way more than $60 mind you! What Ashley and I have on is a good 2 colors with glitter! Huiwen has been very kind to us as our nail sponsor. It really touched me that, when I told her we had a Benefit even to attend on the 28th of February, she invited us to come down earlier, so she could always fix any mishaps that happened even a day later! It was just so thoughtful, and it made me feel that we could always trust her with our nail designs! She mentioned that she does do house calls, though those may cost up to $100 and above because most of the people who require the service ask for very complicated designs. She also does wedding nails, which include gel/acrylic extensions, 4D flowers and ribbons, all the works. You name it, she's got it. It's pretty easy to get there, the only problem MIGHT be the hassle, especially for people who live as far as we do. Personally, we don't quite mind because the trip is pretty straightforward. 2) Head to Berth 12 and wait for bus 912. I think you can take 912E as well. 3) Press the bell when you see The Woodgrove (2nd picture) ahead, the bus stop's right in front of it. 4) Head towards the traffic light to cross to Blk 335 opposite. 5) Take the lift further away from the crossing, because there are 2 going to different units. For people as non-geographically inclined as we are, we got there pretty quickly, so don't worry! Find out more about her designs and services on her Facebook as well. Thank you for our gorgeous nails!